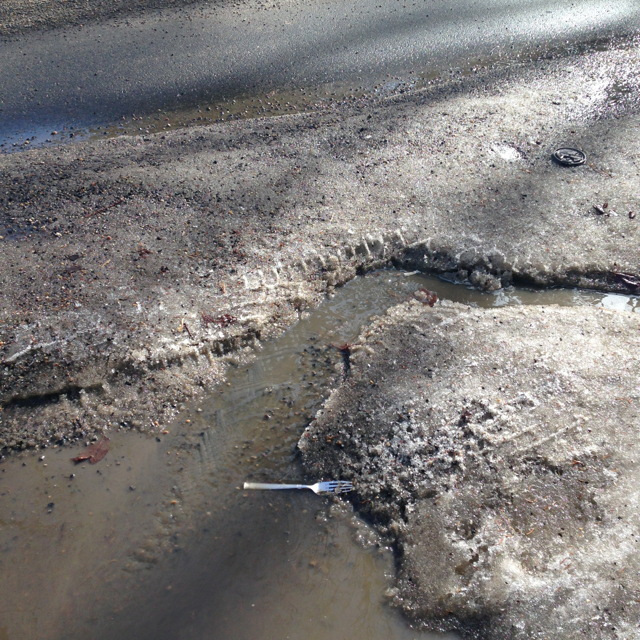 I have to laugh – a fork was in the road on the street in front of my house, recently released with spring’s warm embrace. It is not my fork; it is a found fork, a little worse for wear. It symbolizes the cosmic carrots floating around me at the moment. Over the course of the winter, like my city planner friend Nola, I have been pondering my desire line – the path I want to be travelling in my work. In January, it was perfectly clear. My book is nearing completion and it is time to prepare for its release out into the world. For seven years, I have enjoyed a wonderful balance of time to write, and time for paid work with wonderful people, in the form of small contracts. This has been wonderfully nourishing and I long to merge what I have learned in writing with my work out in the world. Of course, I have been putting into practice, and working with great people; I long to put these two things together for the long term, for larger contribution to the well-being of cities and citizens. In response to these longings I extended an invitation to 13 local, wonderful people with whom I want to step out into the work world, to be a team of some sort. We quickly met to begin our dive into an evolutionary purpose I sense we serve for cities: to create the conditions for cities to serve citizens well, and for citizens to serve cities well. We to discern the work we are called to do for the city. We called it the carrot of potential. And no sooner does this process begin and the Universe taps me on the shoulder to test my resolve. A cosmic carrot. It came in the form of a phone call from a headhunter inviting me to apply for a job. I surprised myself and said yes to exploring the opportunity. I went for coffee with the bigwig to see if he and the organization were a fit for me, then had a first interview, and a second interview. I am now waiting for word. And while I wait, another laugh as another cosmic carrot emerges. This time in the form of a tingling, an attraction to a big idea, to a way to serve my city and cities everywhere. Invisible thresholds emerge to test me. Like the fork in the road, they are emerging as the snow melts. And because they emerge, my destination is changing too. I am emerging to a new destination. It may be a big job, or a big idea, or some combination of both. The discernment I have in front of me is to figure out which destination will move me in the direction I want to go. For now, I sit in the unknown, nourished by these cosmic carrots. The possibilities before us are known and unknown. The cosmic carrots, the thresholds, play an essential role as we chaotically reorganize ourselves to move in the direction we long to go. What carrots are nourishing you? I found the knife in my yard..to cut the cosmic carrot perhaps on biteable pieces to show on? Ha ha… Cosmic autocorrection : in biteable pieces to chew on..
🙂 that’s how neighbours can work together, eh? Provide a full set of cutlery to enjoy a good meal together! Here’s another piece in the puzzle. Full solar eclipse with the spring equinox – total system reboot. Next Next post: What are you inviting?